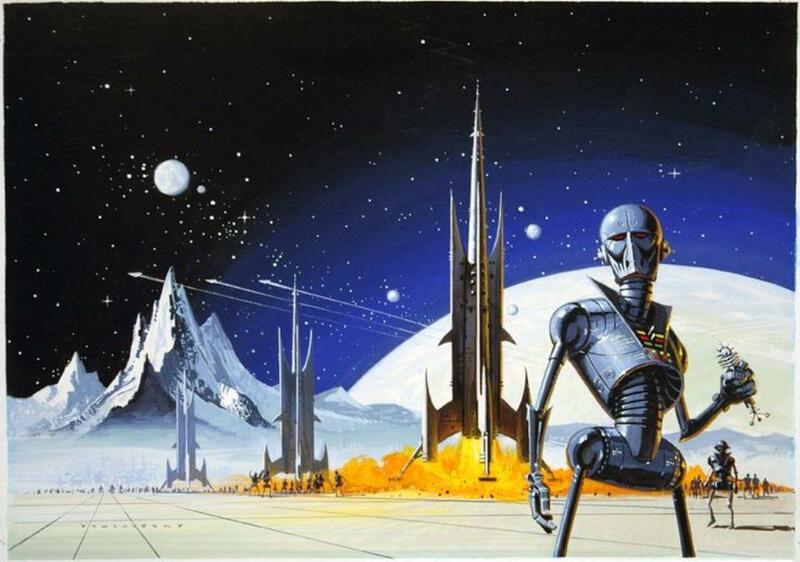 What if our Cold War space probes combined, replicated, evolved into a society of droids and then decided to pay us a visit? Would they hold to any of the ideals of their Soviet or Western makers? If so, would they then try to impove mankind into a more "perfect" society, in their image? Or would they just hit the reset button and eradicate us? Would it be fun to game such a war? Reminds me of a Necron. Given the time line, it would be truer to say that the Necrons remind you of this painting. … as for the original question, I wouldn't expect them to take on US or Russian traits… but they would likely be quite friendly because they were sent out as welcome mats. Here are other droids by the same artist. Star Trek did an episode and a movie about evolved probes. I remember that episode and movie, "Veyger", IIRC ! I have a 6mm Necron force made up of GW, DRM, HLS/EW, and other 6mm humanoid 'bots awaiting paint. "AI's of the Galaxy unite !" RudyNelson and Legion4 got to it first! Given the state of modern AI and what Google andvithers have learned, the first thing an AI does is rewrite it's own rules. Our best hope in this scenario is that their objectives are not on the other side of us. Premise: Not all of the probes made it out of earth orbit, we just didn't hear about them because no one wanted the bad press. 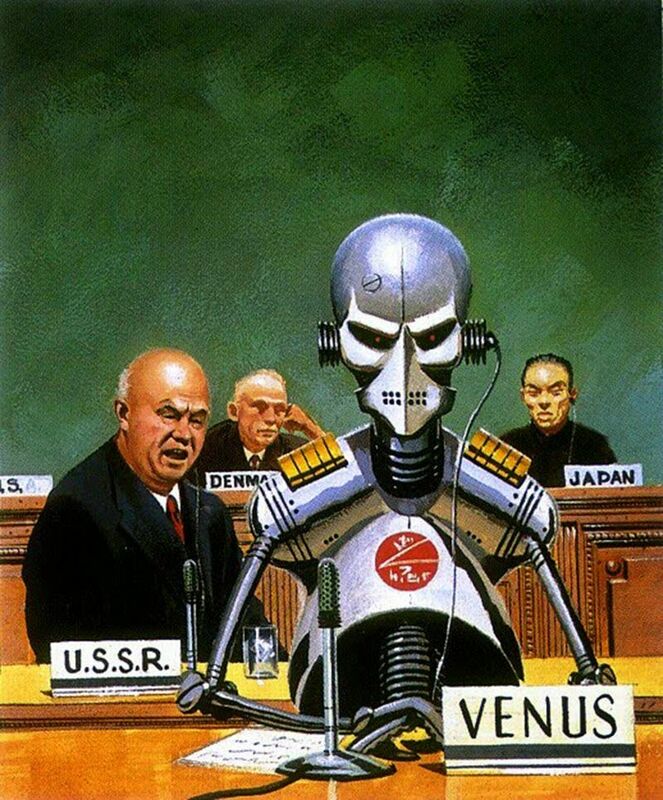 US and USSR probes (and maybe some Chineese or other's) did 'collide', join up and form an AI consciousness. It's goal is still to reach out and explore, but it has to get out of Earth orbit first. The resources it needs to build a bigger self and propulsion system are all on Earth. Thus begins the invasion: smash and grab raids on research facilities to gather scientists, or their research; occupation of rocket launch sites to facilitate getting resources into orbit; punitive strikes against threats; recon drones sent to find secret labs; etc. Could be the Skynet terminator wars, just early. Oh, and I love the spaceships in the top picture! Maybe they did already, and became us? After all men are from Mars and women are from Venus! You are so much better at writing up these premises! I read a sci-fi story eons ago about an alien exploratory machine landing on Titan. It deployed micro machines to harvest resources to build more/bigger machines. Trouble was the software driving it all was corrupted. By the time humans got there, a medieval robotic society had formed itself. 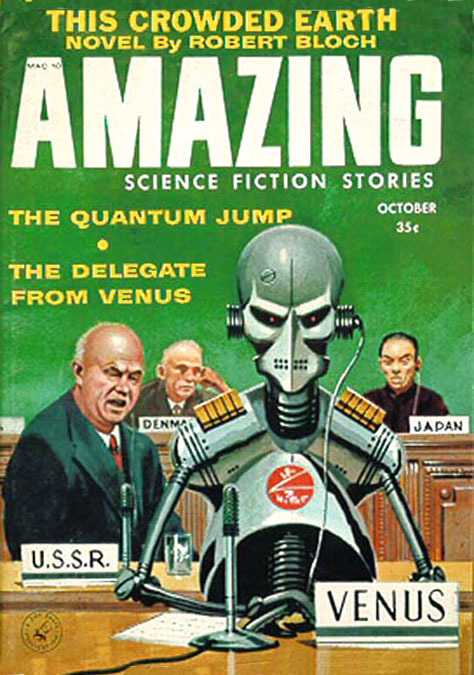 Th Sci-fi story was "Code of the lifemaker" by James P Hogan, and the main point was a series of transcription errors of a automated mining probe ends up introducing evolutionary pressure on robots, end up with not just a robot society but a whole robotic ecosystem, with the equivalent of robotic plants, animals, even robotic terrain features (Giant conveyor systems that went on for hundreds of miles that were equivalent to rivers).